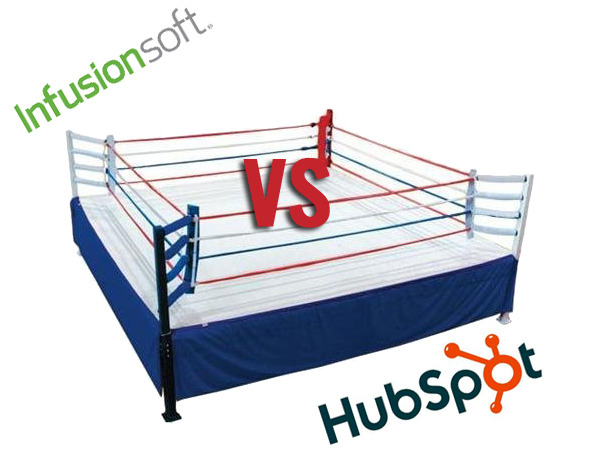 HubSpot vs. Infusionsoft: Which Inbound Marketing Software Tool is Best for Your Company? Choosing an all-in-one marketing software can be a tough task especially when there are so many similar options available with so little information on which is right for your company. What tools do you need and why? Can your company afford to be without eCommerce capabilities baked into the tool? Will a CMS or a CRM be more valuable to you? All of these questions are valid and while some may be more difficult to answer than others, this comparison should help you come to the conclusion needed to benefit your company. 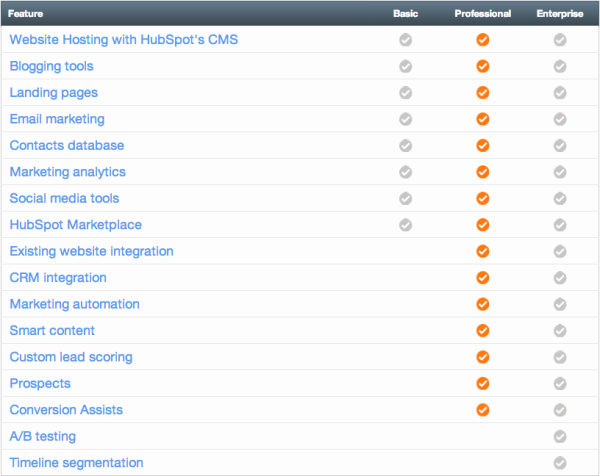 At the end of the day, both HubSpot and Infusionsoft are packed full of features. Each inbound marketing tool intends to provide you with automation and optimization for your online presence and execution of your marketing strategy. While both HubSpot and Infusionsoft tote the phrase all-in-one marketing software on their websites, each software tool is significantly different in the features they offer their consumers. How can they be that different? Firstly, their target markets are very different, but well get to that later. Secondly, HubSpot focuses on providing a seamlessly integrated content management system (CMS) with easy to use optimization tools including keyword analytics and SEO reminders throughout the tool. Infusionsoft focuses primarily on a functional, but small, CRM with eCommerce capabilities superior to those HubSpot offers. To make this decision, you should first prioritize the features needed to execute your marketing strategies effectively and then make a decision on which all-in-one software works best for you and your company. First and foremost you should always consider which product aligns most with your company's needs, objectives, and goals. Write down your goals, share them with your team, and then filter based on these 4 criterion. As mentioned above, prioritizing the features that matter to you is the most important consideration in your due diligence. Do the features and functionality align with what you hope to achieve through your marketing efforts? What are the differences between the platforms? Truthfully, both platforms are very similar, so lets compare apples to apples and look at the Professional package from HubSpot vs. the Plus package from Infusionsoft. Infusionsoft offers a Small Business CRM and Post-Sale Automation within their product allowing users to integrate sales and marketing in one place; HubSpot sort of does this by allowing you to integrate via an API with your current CRM (e.g. you can connect HubSpot to SalesForce or Zoho or just about any other CRM by attaching a string of code that allows the two to talk to each other). 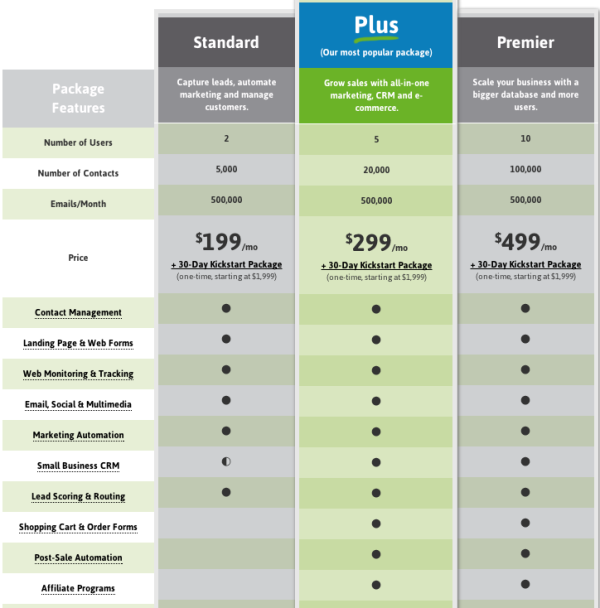 Infusionsoft includes a shopping cart and order forms making it a great choice for eCommerce customers. Truth be told, HubSpot is lacking in this department. It is not built specifically for eCommerce shops. However, there are several ways to integrate you eCommerce site into HubSpot via the App Marketplace. HubSpot earns kudos for having a dedicated consulting team that focuses solely on eCommerce customers becoming successful. HubSpot offers Smart content that can be built right within the tool. From a marketing standpoint, this is HUGE. HubSpot allows you to customize calls-to-action (CTAs) based on which stage of the buying cycle your lead is in. The CTA changes in real time on your website when your lead visits for the second, third, forth, etc. time. You set up the rules in HubSpot so your lead doesnt see the same offer twice. You can also set up Smart fields on forms in HubSpot making downloading several offers much less cumbersome for your leads. Smart form fields hide themselves if a lead has already filled out that form field in HubSpot. Hubspot and Infusionsoft offer landing page and form creation tools and marketing analytic tools. Both platforms offer solid email capabilities. List segmentation, campaign execution tools, design templates, nurturing functionality and analytics. Infusionsofts email tool highlights a graphical interface. Visually oriented users may find that to be an advantage in laying out campaigns. You can schedule and maintain social media accounts on both platforms. Recent changes to the HubSpot tool have made them on par with HootSuite. Both platforms offer lead scoring, which is important in tracking prospect advancement through your sales process. Both solutions are extremely intuitive and easy to use provided you put in enough sweat equity to get trained on functionality. Both companies are leaders in the inbound marketing space and the quality of their products emphasizes this point. With any new tool it is important to ensure youre trained accordingly. Well talk more about this in a bit. Bottom line: After researching a bit, it is apparent that each all-in-one software company focuses on different target audiences. HubSpot is focused on solving for the small and medium sized business that need to amp up their marketing, while Infusionsoft focuses on solving for the very small business owner. This doesnt mean that you cant be successful with one or the other if you dont fit the mold. It simply means their core audience is different. Remember: Choose the software that encompasses features that work best for your company, objectives, and goals. When choosing inbound marketing software, you need to consider adaptability of the program. You should have the ability to easily integrate specialty tools of choice (like a CRM or current blog). The app and service marketplace should have a growing database with frequent new updates (consider the iPhone App Marketplace vs. the Windows Phone App Marketplace. Which is more appealing?). Having buy-in from developers of the product is critical. What does this mean for you? It means that the core product will also continue to grow and improve. 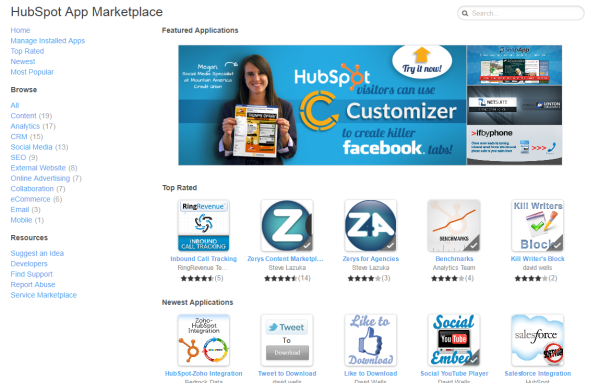 HubSpots App Marketplace offers over 150 applications that cover core areas such as: Social Media, Ecommerce, CRM, SEO, Analytics, Content Creators, and Mobile. Each application is an extension of the HubSpot platform making the user experience easy and seamless. A lot of the applications are free or free to try. Others are a flat fee or subscription based (similar to phone apps). Apps are rated by users and use a 1 to 5 rating scale. One of the biggest questions surrounding HubSpot is why do I need the HubSpot CMS if I have Wordpress? Firstly, the CMS is great for hosting your landing pages and the blog functionality is impeccable giving you cues as to whether or not your posts are optimized. However, if youve been posting on Wordpress for ages and dont want to move everything over to HubSpot, its not a problem. You can download the free Wordpress app from the marketplace and still get all of the core analytics you need to improve your marketing. This is just one example of how the HubSpot App Marketplace works seamlessly with your current solutions. 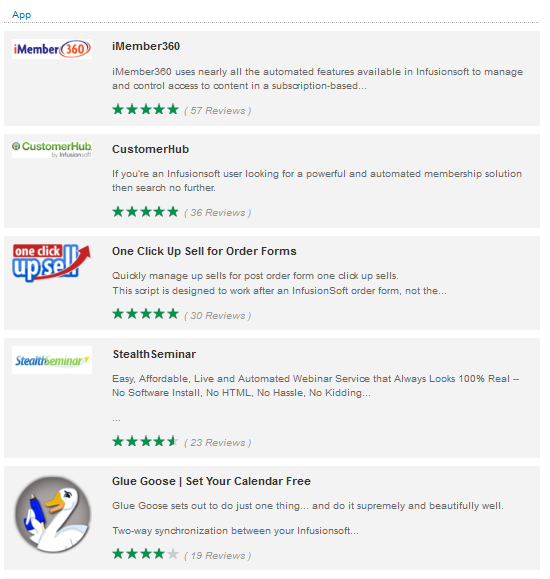 Infusionsoft currently shows 80+ applications available for users to integrate with their account. Categories that can be searched are: Business Management, Analytics, Accounting, Social and Lead Generation, eCommerce. Apps are rated from 1 to 5 stars like HubSpot. Pricing is also similar to HubSpot (some free, some flat fee and some subscription based). A lot of apps focus on the selling side of your business as they are trying to solve for the very small business owner. Training and support functionality at each company is extremely important given that a lot of this software is new. The whole concept of inbound marketing is new to a lot of people, so it is important that you choose a program that not only suits your needs but also the ability to train incoming employees as your company grows. 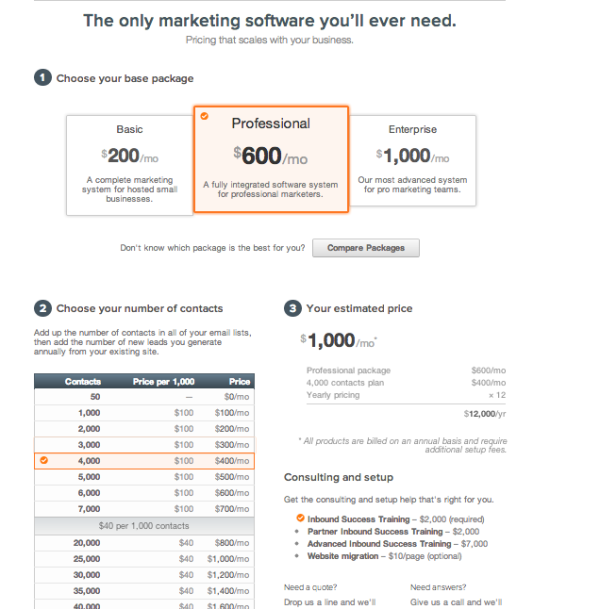 You can buy HubSpot in one of three versions: Basic, Professional, or Enterprise. The training and onboarding comittment is similar across the versions, but typically varies in cost, depth and intensity. Basically, the more advanced your product, the more training you're going to need. Why does HubSpot require the training and onboarding? It's simple. HubSpot is a new tool to many and can be daunting when first getting started. It is HubSpot's goal to make you as successful as possible. Your consultant will inevitably ensure this happens. It's worth it! Inbound Conference  an annual three day conference which provides information on the new and upcoming features in the software, along with six tracks of training tailored for beginners all the way to advanced users. Overall, the training at HubSpot is impeccable. You're learning from the best of the best inbound marketers across industries. Additional packaged campaigns at a cost starting at $2000. You should never consider pricing first when choosing an inbound marketing software. Why? It's simple. 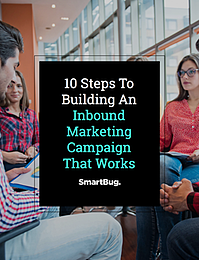 Inbound marketing is not a feature of your business. It is a critical component to the success of your sales team. Without inbound leads, your sales team suffers and let's face it: your company is nothing with out hot leads and a terrific sales process. Training Costs - These are mostly one time fees baked into your first payment, but they definitely add up. Make sure to choose what makes sense for you and your company. More importantly: GET THE BEST TRAINING! Additonal Integrations - A lot of customers do not take into consideration their need for additional integrations or design work. For example, if your site is extremely design heavy and you'd like your forms to look a particular way you will need an API to source your lead information from forms into your contact database. Unless you are extremely code savvy, building an API will require a developer, an additional cost that is not always apparent in the sales process. Content Development - The biggest misconception with marketing software companies is that they do the marketing for you. Wrong! You still handle your own marketing. Infusionsoft and HubSpot simply provide the tool for you to consolidate and make things a bit easier to manage. It can be extremely challenging to generate all of the content needed to be successful in inbound marketing, so make sure to allocate a monthly budget for a marketing partner to help you with this. It may seem like a lot in the beginning but the ROI is huge! After considering the above information and comparing and constrating Infusionsoft with HubSpot, which do you think works best for you and your company? Dolly Howard is the Director of Marketing for SmartBug Media. Previously she worked as a senior marketing consultant leading SmartBug Media clients in strategy for lead conversion improvement and total marketing ROI. 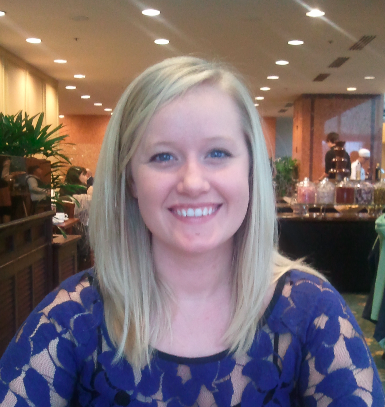 As a past HubSpot employee, Dolly is excited to share her knowledge and help enterprise companies grow their business. Subscribe to the SmartBug Blog below to see more posts from Dolly and the SmartBug team. Read more articles by Dolly Howard.